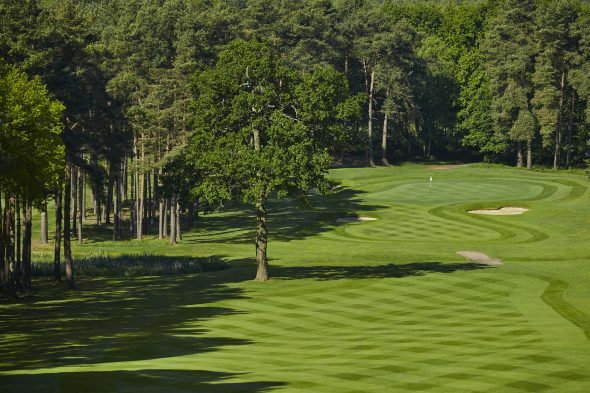 Foxhills Club & Resort is determined to build on its growing reputation as a top-level tournament venue as it prepares to create the next stern test for the professionals. After glowing reports from the competitors and officials from the recent Silversea PGA Senior Championship, the historic Surrey resort is aiming to shine again as it hosts the IFX Championship on the EuroPro Tour (August 1-3). Director of golf, Chris Fitt, has vowed to make the Bernard Hunt course set-up as difficult as possible for the up-and-coming talents on the third tier of European golf and he is keen to make them work for their shot at the £10,000 winner’s cheque. Fitt said: “We received really positive feedback about the set-up for the PGA Senior Championship but we will create a different challenge for the EuroPro event in August. “These guys regularly hit the ball more than 300 yards and you can only push the tees back so far but there is more to golf than hitting the ball a long way. The greens will be firm and fast and some of the pin placements will be about as tough as we can make them. Fitt admits there is a balance to be struck in hosting tournaments which meet the high standards of the top professionals while also maintaining playability for the regular members. He said: “When we hosted the 2017 PGA Cup, the players and officials were delighted. The course looked fantastic and it was a really tough test, which is exactly what they wanted. “But the reality was that it was probably too tough for our members around that time so there is always a balance to be struck and I think we have learned from that.